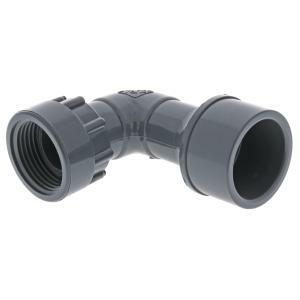 A Schedule 40 PVC manifold elbow with 1" slip and 1" female pipe threads (FPT) with swivel for connecting your manifold system to 1" PVC pipe at a 90 degree turn. Gray Schedule 40 PVC manifold fittings have nitril rubber o-rings so no pipe dope or teflon tape is needed. Assemble valves without gluing for an easy to repair/replace valve manifold system. Hand tighten only. PVC Slip connections require primer/glue.